Blog › What's An AK? 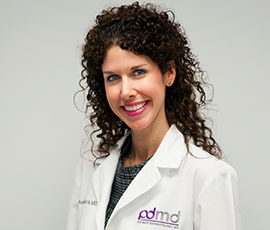 On Premier Dermatology, MD's facebook page, (like us!) Dr. Bilu Martin posted a photo of herself to show a spot on her cheek that she treated. The spot is an actinic keratosis (AK), and they are quite commonly seen, especially in South Florida. Aks debut as rough, scaly patches that are usually red, pink, or brownish. They feel like sandpaper. They can develop anywhere but are often found on the scalp (in men), cheeks, nose, lips, ears, backs of the hands, and chest. Often, there are multiple Aks, in which case they are called actinic keratoses. These spots are PRE-cancerous. They are caused by exposure to the sun. A very low percentage of actinic keratoses, around 10%, may develop into a type of skin cancer called squamous cell carcinoma (SCC). Squamous cell carcinomas can be removed in the dermatologist's office surgically. There are a variety of treatments for actinic keratoses. They can be frozen with liquid nitrogen, either with a spray or a cotton-tipped applicator. This will result in a red, crusty spot for a few days and then will resolve. There are also topical medications, such as 5-fluorouracil, imiquimod, diclofenac, and ingenol mebutate that a dermatologist can prescribe. These are applied to the Aks for a few weeks to months, depending on which cream is used. They will almost often cause redness, crusting, and irritation to the area in which they are applied, which then goes away. Sometimes a combination of freezing and creams are used. Photodynamic therapy (PDT) is an in-office treatment that is also quite effective to treat AKs. The best way to prevent the formation of actinic keratoses and skin cancer is to protect your skin from the sun. Use a broad-spectrum sunblock. Seek the shade. Wear sun protective clothing. And remember to have regular skin examinations. Early detection and prevention is key!